Spectacular house available for the summer. 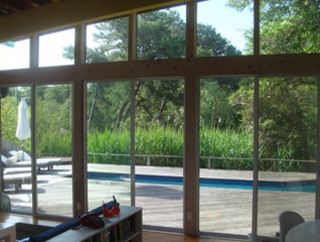 Large living room with walls of glass onto the pool. Fireplace. Open gourmet kitchen. Four equal master suites with private baths. AC in the four suites. Great rental! Four large air conditioned bedrooms. Each bedroom with its own bath. 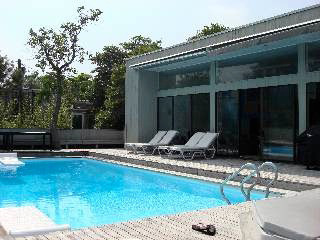 A powder room, spacious living room thats also air conditioned, big and sunny pool deck with a hot tub. In one word. Impeccable! This house is top of the line. A most stunning setting on the bay. Waterfront pool deck. This house is meticulously maintained. Has stunning living room with walls of glass, gourmet chefs kitchen with top of the line appliances and a fantastic floor plan. This spectacular house on the Great South Bay was designed by the renowned Architectural firm of Bromley-Caldari. The house boasts a wonderful floor plan and all the amenities. Grand scale great room with open kitchen. 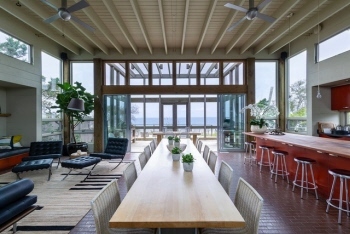 Walls of glass open into the large screen room with the Great South Bay just outside. Two master suites are in the house plus a separate bedroom suite across the heated pool. Lush landscaping. Must be seen to be appreciated. 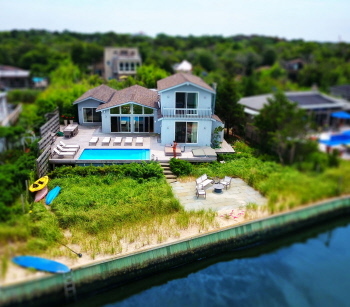 Lovely classic Fire Island Pines house for your summer plans. Light and bright. Two-story contemporary. Large sunny pool. Second floor decks with bay views. Spacious living room with open kitchen. Plus a den. Four bedrooms. WIFI. Gas BBQ.